Housing in Santa Monica is understandably highly prized: The air is clear and cool, the ocean is nearby, and there is ample public transportation, including the new Expo Line connecting Santa Monica to Downtown Los Angeles. The arrival of high-tech employers like Google and Twitter has given the area a new name: Silicon Beach. And so, young professionals seeking employment, enjoyment, and well-designed, efficient apartments are searching L.A.’s coastal areas for affordable, convenient housing. One of the more forward-thinking design responses to this need involves what is typically viewed as a restriction: height setbacks. Michael W. Folonis Architects, who is designing several housing projects that include both market-rate and affordable apartments in the area, has taken an innovative approach to setback requirements in its six-story complex at 1415 Fifth Street. This mid-block development, with 100 feet of street frontage on a 150-foot-deep site, contains 64 units, 13 of which are affordable, and includes a mix of studios, one-bedroom, two-bedroom, and three-bedroom units. 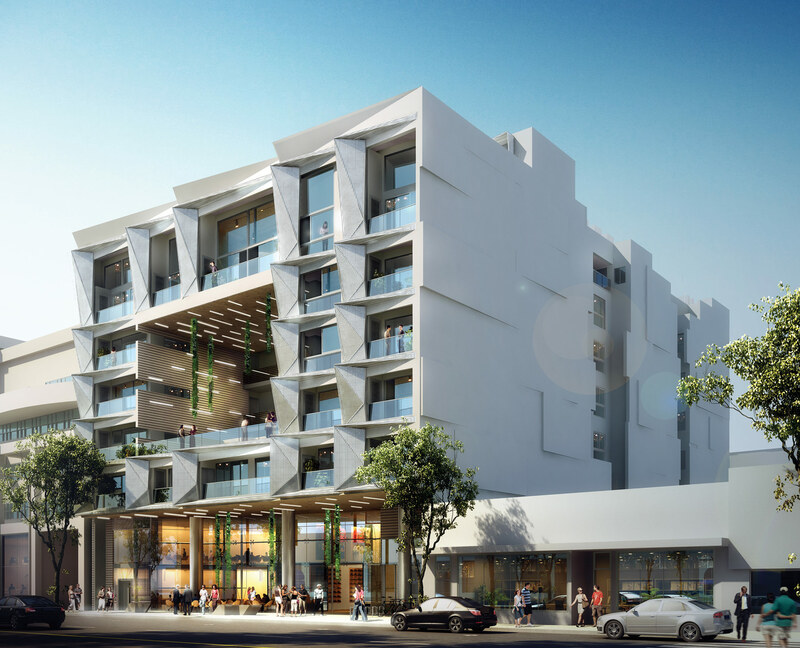 Santa Monica has adopted the Affordable Housing Production Program (AHPP) requiring that 20 percent of new units serve moderate-income residents. One of the unique challenges for architects working in the City of Santa Monica is responding to the “step-back” requirements of the planning and zoning department: Typically the building volume is set back just 10 feet on the ground floor and then steps back further on each of the upper floors, like a giant staircase. At 1415 Fifth Street, this required a setback of 84,600 cubic feet to be removed from the development envelope. In an inventive alternative solution, Folonis proposed a deeper setback on the ground plane, creating a large open space for outdoor dining and interaction with the community. 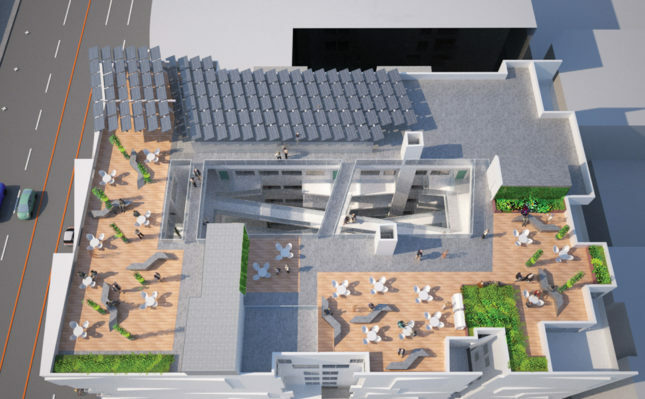 In addition, Folonis created a major three-story open portal that allows natural light and ventilation to flow into a central courtyard that is open to the sky. This achieved 88,563 cubic feet of open space, more than required by the planning and zoning department. 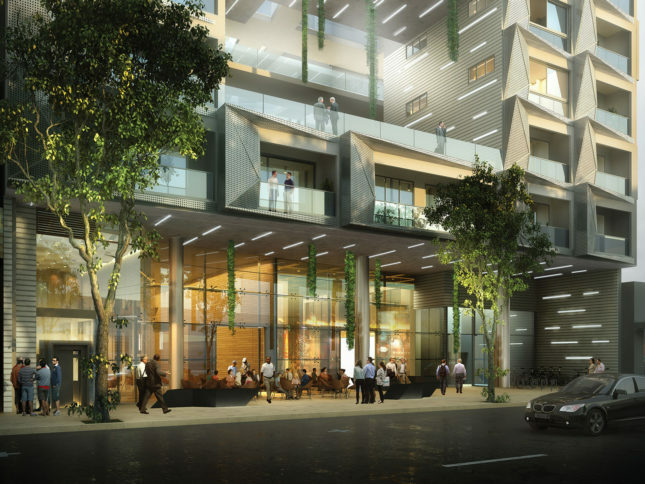 The design maintains the cornice line, while the portal provides residents with an outdoor amenity that Folonis describes as “a cultural, social gathering place” that connects residents to city street life. Travis Page, City of Santa Monica senior planner, said, “It’s unusual for an amazing idea like this to come forward” from the planning and zoning requirements. The city is looking at modifying the requirements to encourage future creative solutions. The exterior facade facing southwest employs dramatic perforated aluminum sunshades that were generated directly from solar studies to allow sunlight to enter in the winter and also provide shade in the summer. This “passive solar design” is an integral part of Folonis’s design approach that he has been practicing since 1983. 1415 Fifth Street also provides bike storage for 150 bicycles, and the complex is just two blocks from the new Metro Light Rail station, which encourages the use of public transportation. All units benefit from natural ventilation, reducing the use of mechanical ventilation. The project is expected to break ground later this year and to be complete in 2017.